IS DECLINING REIMBURSEMENT FORCING NEUROLOGY INTO EXTINCTION? Orly Avitzur, MD, will be serving as faculty with Bruce Sigsbee, MD, for the course, “Practice Survival for Neurologists: Business Strategies for Thriving in the Office and Avoiding Financial Pitfalls,” at the AAN Annual Meeting in San Francisco, CA, on Tuesday, April 27. In spite of working more than 100 hours a week, forsaking vacations and days off, Nacogdoches, TX, neurologist Stephen P. Busby, MD, found his practice expenses were outstripping revenues. Most payers had cut their reimbursements and some had stopped paying at all, refusing to honor their contracts. Malpractice insurance had risen fivefold, his office rent had gone up, his secretary had asked for a well-deserved raise, and his practice management vendor had demanded $20,000 for the software upgrade needed to make his billing system HIPAA-compliant. With three children in college, the pressure of trying to make ends meet was overwhelming. “I once thought that going into medicine would guarantee me a living. I never envisioned that, at 54, I would be working harder than ever and going broke,” Dr. Busby said. When he read an ad in his local paper for a weekend course in tractor-trailer driving that would pay a much better salary, he decided to call it quits. According to the AAN and American Medical Association (AMA) survey released last March, 11.2 percent of neurologists had left their practice. Much has been written about physician burn-out causing exhausted doctors to close shop, but the neurologists who spoke with Neurology Today all said that they loved their jobs. So why did they quit? Their stories – while not necessarily representative of the field as a whole – underscore today's challenges in managing neurology practices. “Many neurologists today face the same ethical dilemma I faced,” said Judith A. Willis, MD, who left the job she loved after 20 years of practicing neurology in Santa Barbara, CA, when she felt that government and insurance regulators were dictating the care of her patients. Some believe a single-payer system is the answer to this crisis, but Canadian neurologists, who have worked under such a system, cite its own problems. Irena Danys, MD, had practiced neurology and specialized in sleep disorders in Ontario for 10 years, working 80 hours a week between her practice and running a sleep laboratory. But, when she relocated to New Hampshire, she was not sure she wanted to continue at that pace. All too often neurologists sign managed care contracts without analyzing whether they are money-losing propositions. “Neurologists are motivated to sign these contracts because they are afraid of being left out and losing patients,” Dr. Swift said. “It's not until they do the practice analysis – if they ever do – that the truth sinks in and they opt out.” But the decision is complex, said Dr. Swift, who warned that the consequences may be greater than initially perceived since higher-paying procedural income is forfeited as well. Cincinnati physicians took a different course of action after a March 2003 analysis for a coalition of employers, health plans, and systems verified that the reimbursement crisis – perhaps one of the most serious in the country – had contributed to shortages of 14 kinds of specialists, including neurologists. A subsequent survey in April 2003, sponsored by the Academy of Medicine of Cincinnati, revealed that about half of the physicians planned to cut back hours, close their practice to new patients, or close practice altogether. The Academy of Medicine of Cincinnati also filed lawsuits against four separate insurers alleging that they had colluded for years to keep doctor payment rates low; in October 2003, one insurer, Humana Health Plans of Ohio, settled their lawsuit for $100 million. 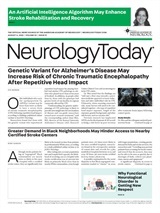 “In Cincinnati, we have been plagued with reimbursements as low as anywhere in the country,” said neurologist James J. Anthony, MD, member of the AAN Medical Economics and Management Subcommittee. Dr. Anthony has also served for five years on the Practice Expense Advisory Committee, fighting on behalf of the AAN for adequate reimbursement for CPT codes, as well as served as an advisor to the AMA committee charged with developing relative value units recommendations for new or revised codes. What has happened to the neurologists who quit? Dr. Willis ultimately went back to school and got an elementary school teaching credential and a master's degree in education. She now teaches fifth grade in Santa Barbara and finds it extremely fulfilling. She is using her background in neuroscience and brain-based educational research to make presentations to educators, concerned citizens, and legislators, and she serves as a consultant to the National Science Foundation. Dr. Lossing is currently working as a Clinical Professor of Neurology at George Washington University Hospital. “I love neurology and continue to teach, but I miss seeing patients,” he said. Dr. Danys, who decided to pursue a lifelong passion and open a specialty coffee shop, is keeping her medical certifications up to date and hopes to return to neurology practice in the future.